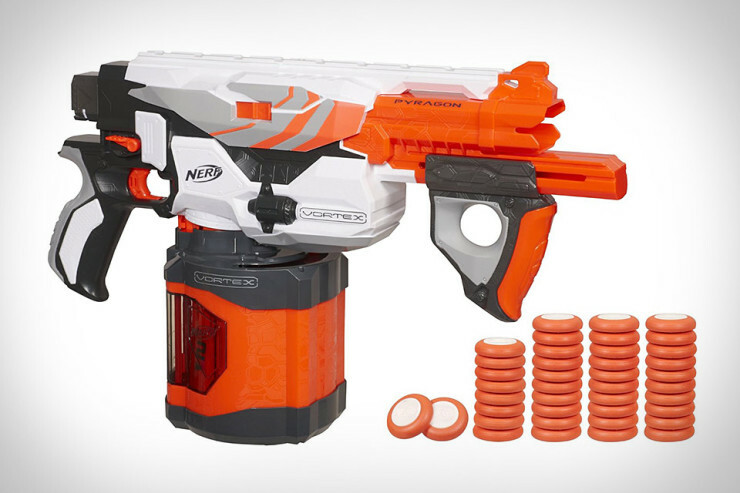 Nerf Vortex Pyragon Blaster Won't Soon Run Out Of Ammo | OhGizmo! By David Ponce on 05/09/13 • Leave a comment! With a self-aggrandizing name like Vortex Pyragon, you’d be forgiven for confusing this plastic toy with Iron Man’s sidearm. But that’s the point, we suppose. Whatever the reasoning behind the toy’s name, it does stand out from other Nerf offerings in that it features a large 40 round magazine. This means you can go on a rampage in the office and won’t run out of “bullets” before you run out of targets. It shoots special Vortex discs and is even capable of fully automatic shooting, though for how many rounds, we’re not sure. There’s even a rail on which you can attach other accessories, which of course are sold separately. The Pyragon will set you back all of $42.